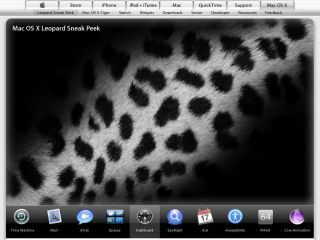 Apple to unveil Leopard on 20 February? Could Apple be about to announce another special event on Tuesday 20 February? So claims Apple Recon , which alleges that besides showing off Mac OS X 10.5 Leopard , new versions of Apple's iWork and iLife productivity and creativity software are to be demonstrated as well. iWork '07 is rumoured to include a new spreadsheet program, plus enhanced versions of word processing app Pages and Keynote, Apple's answer to PowerPoint . iLife '07 is expected to offer signicant upgrades to Apple's range of consumer creativity apps, namely Garageband, iDVD, iMovie, iPhoto, iTunes and iWeb. The company has a track record of keeping new products under wraps until the actual launch - the exception being the Apple iPhone which was announced on 8 January, but isn't actually shipping in the US until June. There are, however, plenty of websites speculating on Apple rumours and prospective launches.